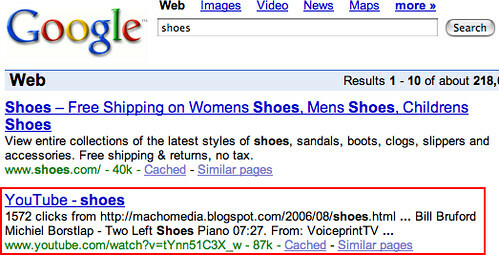 A DigitalPoint Forums thread notes how a Google search on shoes returns a YouTube result. The YouTube video can be found here and it shows a humorous movie on shoes. The thread wonders why anyone searching on shoes would be interested in that. But others find the video entertaining and enjoyable. However, people are beginning to worry if this is another conspiracy theory. Google is going to begin to rank YouTube in the top results, because they now own them. Previous story: Is Google Apps Domain Verification Asking For Trouble?